Do Off-the-Shelf Attractions Have a Place in Disney Parks? Do ‘Off-the-Shelf’ Attractions Have a Place in Disney Parks? One of the many different reasons to visit Disney Parks around the world is the long list of amazingly unique and diverse attractions they offer. These range from classics such as The Enchanted Tiki Room to intense attractions such as Space Mountain, and much more. As was the intent, Disneyland California and the parks which emerged thereafter provide beloved memories which can be experienced regardless of age, family type, size, and many other factors. Amongst the world-renowned attractions both old and new are the “off-the-shelf” attractions, which exist in many Disney Parks. Included on this list are rides such as Dumbo the Flying Elephant, Prince Charming Regal Carrousel, and Primeval Whirl. Similar rides are readily available in theme parks — and local state and county fairs — around the country. Simple, and with a seeming lack of imagination, they could be found anywhere. Many would argue these do not belong side-by-side with nostalgic wonders such as The Jungle Cruise, and to others they fill an important niche. It is important to note that there could be some ambiguity in terms of what attraction is off-the-shelf and what is not. Does the Mad Tea Party count? What about Alien Swirling Saucers? The definition could be debated and discussed. Simply put, an off-the-shelf attraction is any which provides a basic infrastructure which can be easily found throughout the country. And as the term itself denotes, is a very basic attraction with some theming added. Families and solo travelers from around the world come to Disney Parks with a magical vacation in mind. However, not everyone can engage in every experience, either through expense, ability, or the make-up of the group. For some guests of size, they are unable to ride Flight of Passage, and height restrictions might prohibit children from riding many attractions. 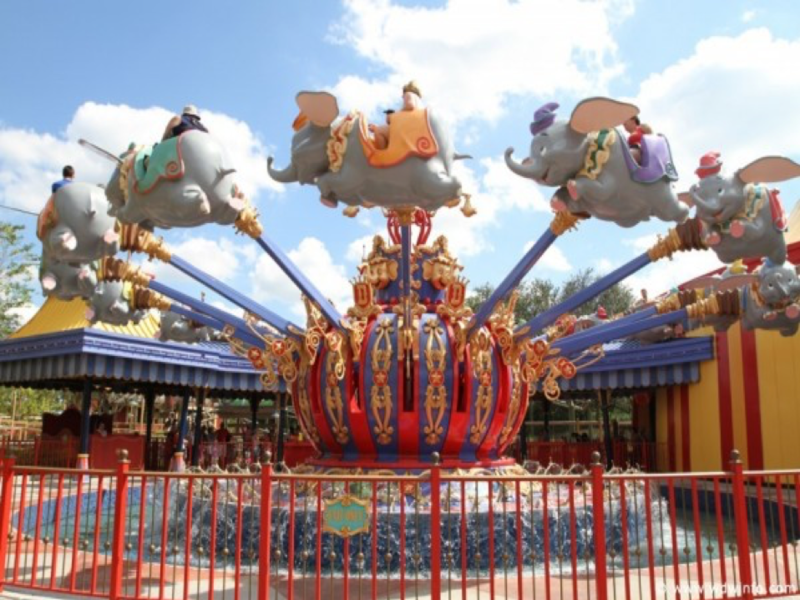 Dumbo the Flying Elephant and TriceraTop Spin allow guests of any height. Concerned about motion sickness or a fear of heights? Attractions such as The Magic Carpets of Aladdin might provide a testing ground to see how much of a problem height or a queasy stomach really are. These can also provide nostalgia. Dumbo the Flying Elephant in California has been open since 1955. In Magic Kingdom it has been open since 1971. This allows Guests who have been visiting the parks since almost the very beginning to enjoy the same attraction (with some changes, admittedly) throughout childhood, adulthood, and onward to several generations. 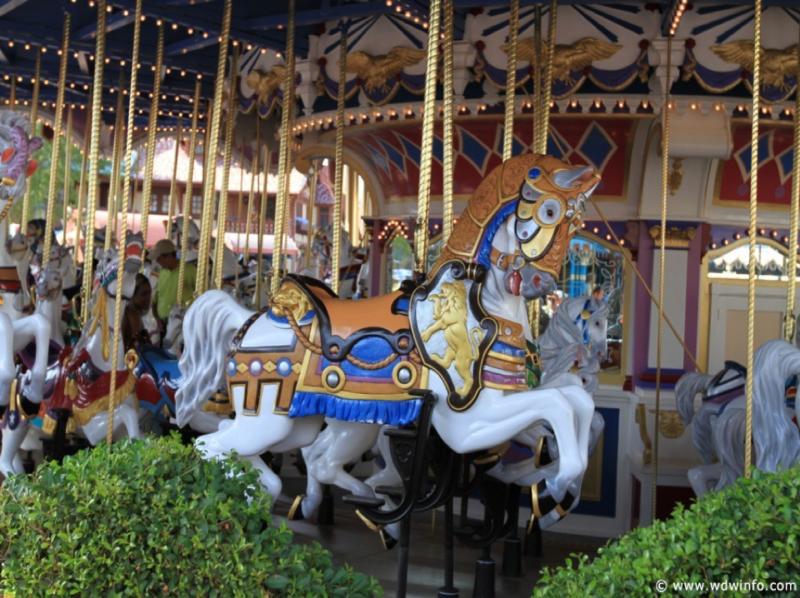 The King Arthur Carrousel in Disneyland has the hallowed honor of being an opening day attraction, featuring 72 unique horses and panels on the canopy recounting the tale of Sleeping Beauty. The Prince Charming Regal Carrousel located behind Cinderella Castle exists right in the center of Magic Kingdom, also with unique horses. Carrousel’s, easily an off-the-shelf attraction, have a special place in the World of Disney. Walt Disney, one afternoon sitting and watching his daughters enjoy a carrousel in Los Angeles’ Griffith Park, in part was inspired to create a park all could enjoy. Disney also supposedly was inspired to include a carrousel in any park he would build. While not massive, these rides take up space. Crowds in Disney Parks are not a new complaint. These attractions take up precious space where crowds could navigate with greater ease, or something else could be constructed in order to allow for greater crowd absorption. The Magic Carpets of Aladdin in Magic Kingdom’s Adventureland is perhaps the most striking example of this, causing significant congestion. Are the Magic Carpets really the best use of space? Would a quick service dining location and seating area better serve guests? Without intelligently adding to the otherwise exotically lush Land, it is arguably even detrimental to Adventureland. 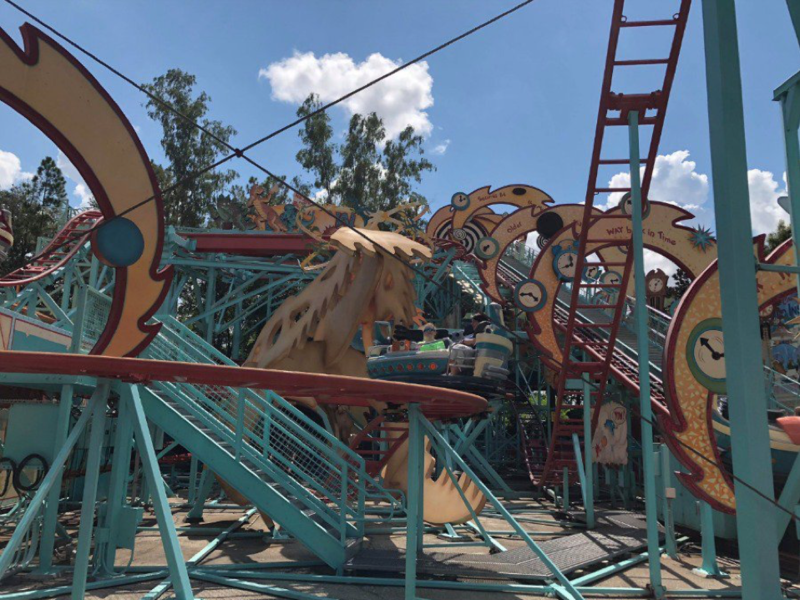 In terms of depleting the theming of a land or park, Animal Kingdom’s DinoLand U.S.A includes two attractions, Primeval Whirl and TriceraTop Spin, which easily fit the category of being off-the-shelf. Animal Kingdom has done such a great job of providing verdant theming, which is reflected in attractions such as the Maharajah Jungle Trek. Many could argue the two above mentioned attractions degrade an otherwise supremely themed park. With Imagineers continually churning out their magic, these attractions show little in terms of real creativity, and often seem thrown in somewhere. 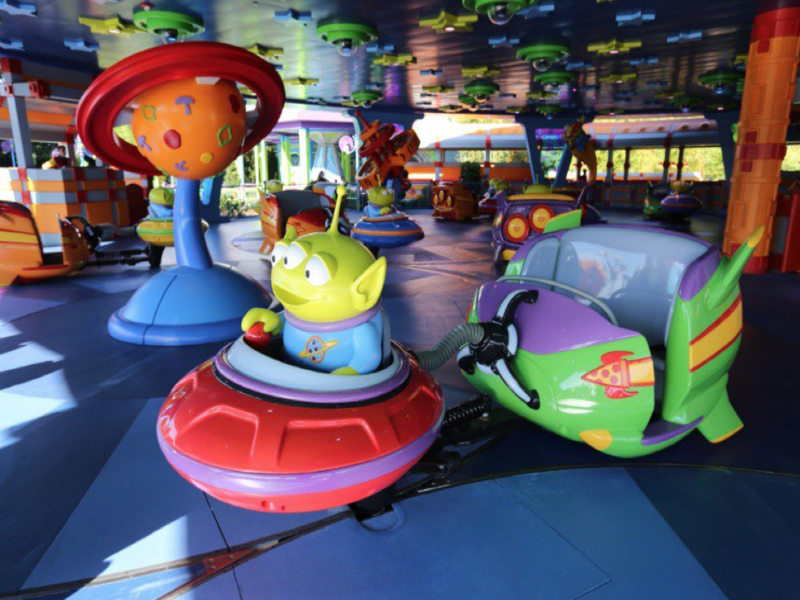 However, if one wishes to pursue a rather liberal definition of what is off-the-shelf, Alien Swirling Saucers in Toy Story Land for instance, was converted for the Holidays to include a partial overlay. The Mad Tea Party also had a whimsical Halloween overlay. Therefore, there is some room to spice these attractions up a bit. Are the Magic Carpets of Aladdin a part of your itinerary on your Walt Disney World visit? Or do you roll your eyes and move along? The Imagineers behind the magic have not lost any of their steam. This is evident in pending projects such as Mickey and Minnie’s Runaway Railway. Off-the-shelf attractions are often visually pleasing, but about as simple as they can get. What are your thoughts on these attractions in the Disney Parks?